30 x 30cm oil on canvas. 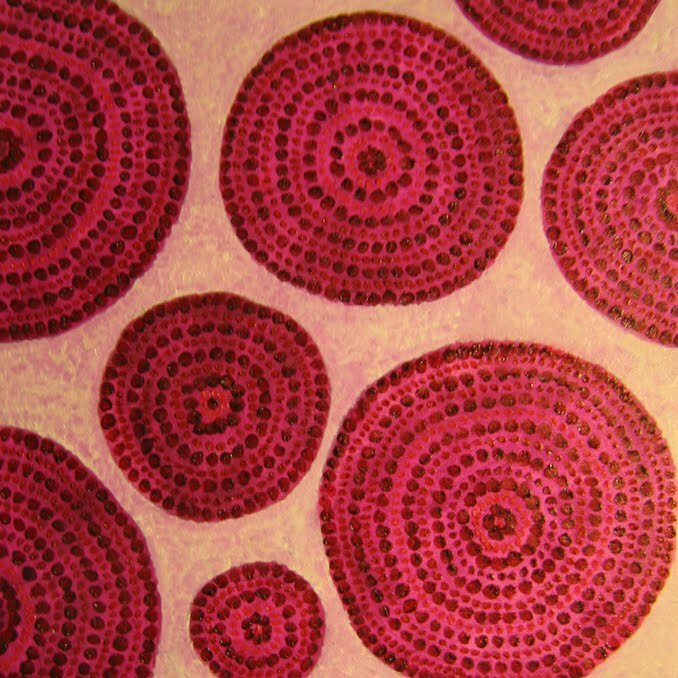 A very Aboriginal dot painting style inspired version of sliced beetroot on a platter. If you've ever been put off beetroot by the 'I can only taste vinegar' pickled stuff in jars or tins from the stupidmarket, this recipes's for you. Thanks to Sue for insisting we have this recipe. I don't think she had any idea it would end up in a book, but then, neither did we at the time. As the story goes, when Sue heard that we were harvesting our first beets, she flew into throes of excitement and began babbling about 'favourite recipe', 'really easy', 'comfort food' and 'reminds me of home' with lots of ooohs and aahs inbetween. So we tried it with some of our freshly pulled beetroot. And we say, 'yum'. Trim the leaves and tail off the beetroot. Boil in a pot of water until you are able to push a fork to the centre of the beetroot. The time will vary depending on the size of the beets. It may take 20 minutes, it may take an hour. When done, drain and rinse in cold water to cool them down so you are able to handle them. Rub the skin off (you may want gloves for this step to avoid red stained hands). This step is really, really easy, as the skin pretty much falls off. Cut the beets into slices and lay on a plate or platter. Sprinkle with salt, pepper and balsamic vinegar. Cover and leave in the fridge overnight and then enjoy as an accompaniment to whatever takes your fancy. We Aussies love adding these to burgers (rest of world shudders in horror!). Ah, go on, try it.